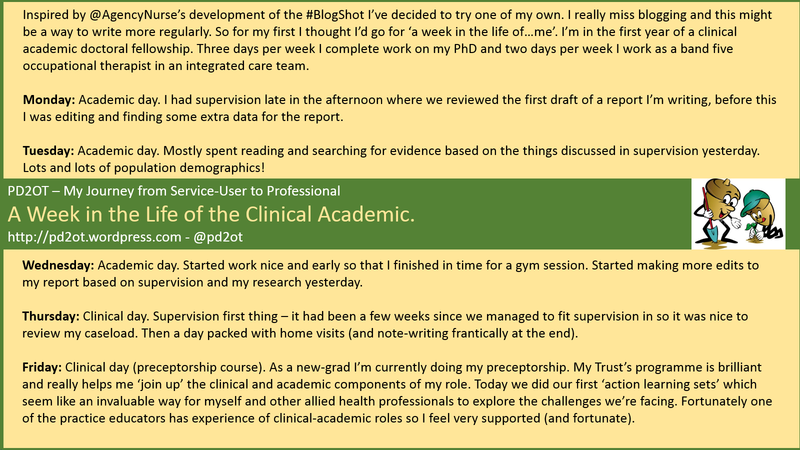 pd2ot | My journey from service user to professional. I’ve been thinking a lot about that lately, and thought it was a good time to write an update. So, things are good and to answer my most frequent (and probably hated) question: nope, not finished the PhD yet, but yes, I will soon! I’m actually in a really good place with my PhD. I’ve loved the process and it’s probably the first time in my life where I have experienced a real contentment to plod through at my own pace, not worrying about my progress in relation to my peers. It’s true that most of my cohort are ahead of me, but that hasn’t phased me. There were some practical issues at the start that meant my project changed quite dramatically after 12 months’ work. I also had 3 months sick leave for a brief period of depression. Since that, though, things have all being going nicely. Sure, I’ve had the dreaded impostor syndrome that most PhD students experience, but it’s never been so bad I thought I wouldn’t get to the end. Mostly I put that down to having fantastic supervisors who I trust 100%. I learned early on that they would always help me get my work to the standard needed. And more recently I had my upgrade viva, which was a fantastic and empowering experience thanks to excellent and thoughtful examiners (top tip: I’ve printed out my upgrade report and have it by my desk for any time that doubts about my ability/value of my research creep in). I’m now approaching the end of my official PhD studentship, but have recently secured a permanent job with the clinical team I was placed with as part of my studentship. Strangely, considering I’ll soon not be an official ‘clinical academic’, I actually feel more like a clinical academic than ever before! I think I’ve recently grown in confidence to incorporate more of my academic skills into my clinical work. It’s also a really exciting time to be working in frailty within my NHS Trust as there’s a real focus on developing our services to be more responsive to the needs of people living with frailty (my research interest). I’m hoping that when I finish the PhD I’ll be able to develop my clinical role in this area a bit more. My research and clinical work are centred on people living with frailty. It’s become my world, I *think* I’m quite good at it and I’m totally committed to continuing in this area. But I’ve recently been reflecting on my route into the profession. As this blog highlighted, my own experience of borderline personality disorder and related ‘care’ drove me into the profession, determined to make a difference. Sometimes I feel sad that I’m not working in mental health and wonder if I could bring more of a contribution to that field. But it was a conscious decision. I love working with older people, and felt that I wanted to, initially at least, prove that I was ‘more’ than my old diagnosis. That doesn’t mean I think there’s anything wrong if people choose to work in an area they have experience of, it’s just for me I knew I needed to spread my wings a little. And the truth is, I probably bring my experience every single day. I think having experienced traumatic and poor care, and been the person labelled as manipulative, disengaged and untreatable, probably influences how I work with others. I try my best to see the person and their situation without judgment, and find ways to work with them rather than forcing my views or being influenced by colleagues’ perceptions. I think I’ve gotten to the point where my history as someone with severe mental health problems is quite a small part of the bigger picture. This year marks ten years since I was finishing an 18 month hospital admission (mostly sectioned, always on 1:1 observations due to severe self-harm) and starting at a therapeutic community. That therapeutic community no longer exists, and when I discovered this it really threw me. I owe my life (both literal and in a ‘having a meaningful life’ sense) to that place and it scares me to think what would have happened to me had it not existed when I needed it. Mostly I feel sad for all those people it won’t have the chance to help. I guess it adds to my determination to keep on living my life, and if I can give something back to others in the process then that’s a bonus. This blog post will endeavour to explore dissociation and its effect on occupational engagement. In terms of my own personal experience dissociation was the last ‘symptom’ I was willing to admit to as I felt great discomfort admitting to engaging in something I had so little control over or understanding of. Dissociation is a challenging topic to write about, not least because everybody’s experience of dissociation is different. It also is difficult to write about something that involves losing touch with reality because the very nature of the experience is difficult to understand/describe when not dissociated, so I apologise if this post lacks the clarity of previous efforts. *Additional note – September 2015* – I started writing this post over 2 years ago and it has languished in my ‘drafts’ folder for a very long time. I think this is indicative of my own struggles to fully process my thoughts about dissociation and its effect on occupation. The ‘Dissociative Experiences Scale’ (DES) is a 28 question screening test for Dissociative Identity Disorder (DID). I suspect very few people would take the test and score a ‘0’. It is expected that the non-clinical population will score below 30 (this equates to a percentage of time that people experience different dissociative experiences) and is noteworthy. The test expects everyone to relate to some experience of dissociation. The example most often quoted is about completing familiar actions on ‘automatic pilot’, for example driving a familiar route. How many times do you find yourself having completed a task, but not actually able to remember the steps you took to complete it because your mind was on other things? On a simple level, this is dissociation. While the DES screens for dissociation as a diagnostic tool in DID, the occurrence of dissociative symptoms in BPD is common. The ninth diagnostic criterion in the Diagnostic and Statistical Manual of Mental Disorders (DSM-V) (American Psychiatric Association, 2013) for BPD (of which a person must have five of the nine symptoms to be diagnosed with BPD) is listed as; ‘transient, stress-related paranoid ideation or severe dissociative symptoms’. Certainly in my experience of receiving treatment in a Therapeutic Community (TC), dissociation was a significant and problematic symptom for many people. I have also known people dually diagnosed with BPD and DID. The DSM V (2013) defines DID as being diagnosable when a person experiences recurrent dissociative episodes, in which behaviour is modified by appearance of a minimum of two separate identities. This can now either be observable by others on self-reported. For the purposes of this post, the dissociative experiences will be considered from the perspective most often associated with BPD, but I wished to acknowledge DID. This feels like an uncomfortable statement to me. And further reflection on this concept lead me to wonder about the types of dissociation experienced. For me, much of my dissociation involved a modified participation in occupations that exist ‘in their own right’, such as self-harm or shopping. The dissociation itself was not the occupation, but it really changed my experience of it. It possibly indicated the complexities of that ‘base-occupation’ for me as it was eliciting such a dissociative response. But what about the experience of being dissociated and re-living trauma? Is that an occupation? Often there is no decision to engage in it. But it can certainly be functional, purposeful and packed full of meaning. While incredibly different in cause and experience, there could be some parallels drawn with the experience of daydreaming – and daydreaming feels like something that could be thought of as a discrete occupation to some. This concept needs more exploration before I finalise my views. While dissociation as an occupation is something I’m uncertain about, I’m much clearer about the effect of dissociation on occupation. In my post on apparent competence, Sue (@BPDFFS) made a very interesting comment that prompted me to reflect. Her feeling was that apparent competence is a mild form of dissociation. As I considered the concept I quickly realised I agreed, there was a certain compatibility with my experience of being able to ‘perform’ in certain situations. I can also relate to the experience of ‘derealisation’ in stressful situations. Often, in high states of arousal I would experience the world as unreal, sometimes like viewing it through a thick fog. This detachment from reality was my way of managing to remain in an environment I found challenging. While derealisation limited full, mindful participation in the occupation occurring, I also believe it provided the opportunity to remain in the situation long enough to allow arousal levels to recede and for participation to occur. I experienced this at college, and salsa, both in the first few sessions. The derealisation ‘bought me enough time’ to stay with the activity and for it not to become something I found too overwhelming. On a similar level, depersonalisation was something I often experienced. I would ‘watch’ myself engage in activities as if it was someone else. Again, this does not allow mindful, integrated participation in occupation but was a sophisticated means of managing high-stress situations. As analysed above, dissociation can have an enabling effect on occupation. It is an important coping strategy for people experiencing high-states of arousal. When in treatment, dissociation was, perhaps controversially (due to the automatic nature of it), called a ‘self-defeating behaviour’ and it is difficult to deny that it prevents integrated, cohesive and meaningful participation in occupations. However, I believe the power of dissociation to provide a means of survival, particularly when used to cope with abuse, must be respected. I can certainly also understand the negative aspects. For me, the vast majority of my self-harm occurred while dissociated. This increased the risk to myself as I was not fully in touch with reality and simply ‘observed’ myself hurting myself. I also had a reduced awareness of pain, and did not have the same protective responses as I might have in a more connected state. Dissociation was also incredibly disruptive when I’d lose large chunks of time when I was trying to study at university – it also felt very hard to explain to my department when I didn’t understand what was happening or why. For people who dissociate in response to situations that replicate traumatic events, dissociation can happen when related perceived threats occur. This can disrupt occupations occurring in a safe environment. For example, a scene in a film may prompt dissociation and re-experiencing of trauma. In this situation the person has responded as if there is danger, despite being entirely safe. 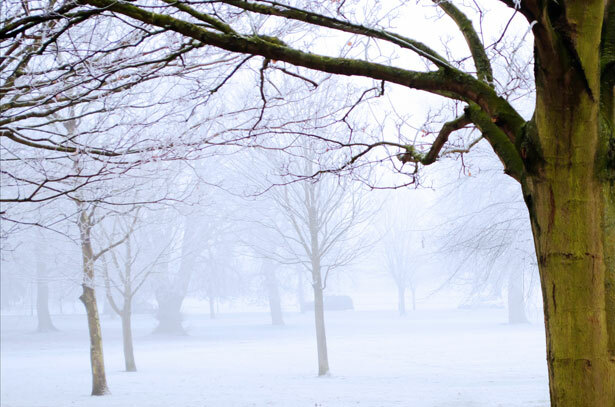 Awareness of the potential for dissociation or re-experiencing of trauma can reduce confidence and pleasure in engaging in such activities, leaving a limited number of safe occupations for the person. I’ve previously written about mindfulness and occupation and while I am not a big fan of ‘minfulness for mindfulness’ sake’ I find mindful participation in activities that truly are purposeful and meaningful to me to be very helpful when I am struggling. In the same respect I find participation in occupations that meet my occupational needs (Doble and Santha, 2008) particularly valuable in reducing dissociation. For example, when I feel accomplished and in control of the occupation it is highly unlikely I would dissociate. However, if the occupation lacks a sense of coherence with my identity, it is much more likely I’d experience some element of dissociation. That said, much like my thoughts on mindfulness, I can also see value in use of mindfulness as an emergency ‘band-aid’ to manage dissociation. If completed ‘well’ (which can be difficult when experiencing the level of distress and detachment associated with dissociation) it comprises such an element of being present that makes complete dissociation and the related detachment from reality very difficult. But as I said, that can be hard to achieve during the onset of dissociation and ultimately I’ve found a longer-term approach to living a life full of congruent, satisfying and meaningful occupations to be a better ‘cure’. I also don;t think occupation is enough to reduce dissociation to a manageable level. It is a powerful coping mechanism that has been developed as a response to life events. So for that reason some other type of therapy is needed to process the feelings, thoughts, emotions or memories linked to the need for a dissociative response. So, yes, possibly the longest I’ve ever taken to write a blog post and it’s far from a complete consideration of dissociation and occupation. However, it’s a start, and I hope I might be able to explore the topic in more depth now that I’ve gotten over the initial hurdle. 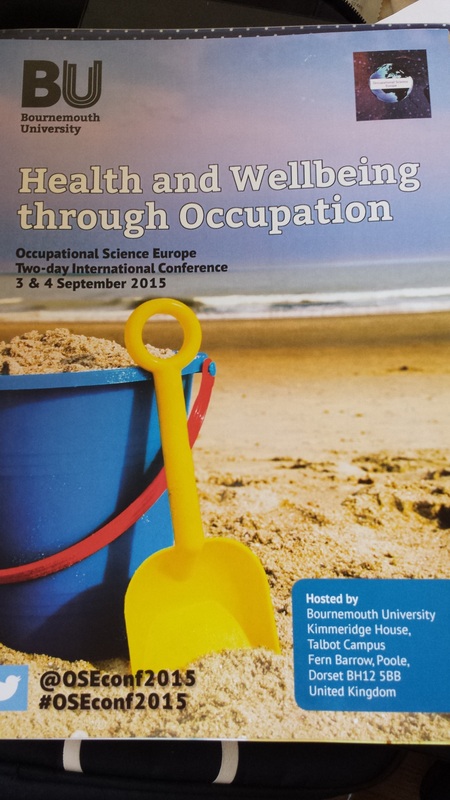 Last week I attended the Occupational Science Europe Conference about “Health and Wellbeing through Occupation” at Bournemouth University. It was a lovely conference and very refreshing to be able to indulge in pure occupational science for two days. I also enjoyed how international a conference it was – I really valued hearing from people working and studying in different systems to the United Kingdom. At the conference I presented a paper about self-defeating occupation in Borderline Personality Disorder. As I predicted in my last blog post about presenting at a conference I wasn’t *quite* as avoidant about preparing for it – leaving it only until the night before this time! I felt more confident that I had valuable material to contribute, but I also had an ‘itch’ to take a step on from my last presentation and completely join things up. At the COTSSMH conference (mentioned in the earlier post) I was aware that those people following on Twitter would have the full story of how I had developed the concept of self-defeating occupations from my own experience of self-harm and eating disorders, but this was not included in the paper and so those not using social media would not know. This time I wanted to make it explicit. I felt it was important to the narrative. I felt it was important to the research concept. I felt it was important to me. I was a person whose valued occupations were ‘self-defeating’ and without understanding the importance of those occupations I couldn’t have found a new way to manage my life. I also wouldn’t have become an occupational therapist or researcher and developed the ideas further. So yes, I included a slide that allowed me to discuss the importance of this blog in generating the research. And when it came to that slide I felt really proud to stand there and explain exactly where the idea came from. It felt honest, and congruent and real. I have no idea if anyone in the audience had any judgements or other negative thoughts, however the feedback I got was overwhelmingly positive and allowed for a much more meaningful discussion in the questions section at the end. This experience got me thinking, yet again, about mental health stigma. It’s a topic I explored in my last blog post and I think I’ve perhaps moved a step onwards. I’ve realised how fed up I am of having to ‘come out’ as someone who has had mental health problems. Not because I’m ashamed, or because I want people to magically ‘just know’. But just because of that uncertainty of how it will be received. Most of the time I’ve found it to be a positive ‘coming out’, but there is always the fear that, just one time, it will be met with prejudice and stigma. I do love the fact that this blog and my Twitter account means that sometimes I get to meet people who already ‘know the full story’ and it’s such a lovely experience to be me, without any further discussions. And obviously there are plenty of people in the world that I meet who never know, or never need to know. But yes, it can get tiring to have to analyse and assess if it will be safe to be honest. And that needs to change. Mental health stigma needs to stop. I can see that the world is changing, but is it changing enough? Related to this topic I was really pleased to discover that Linda Gask, a psychiatrist, has written a book about her experience of having depression. Moreover I valued the discussion on her blog about stigma and only being able to ‘come out’ after retiring. From the blog post I find myself agreeing with the sentiments about the mental health profession’s desire to deny the struggles of those who work in the field. It’s also nice to see a psychiatrist discussing mental illness so candidly. Within the blogging community I can think of many other types of professionals who discuss their own experience, but I haven’t come across many psychiatrists who do – and I can’t imagine for a moment that’s because they don’t have first-hand experience. I’ve ordered the book and am looking forward to reading it, so I may well have some more thoughts soon! So, what have I learned? I’ve realised I’m actually happier when I can join up the person who has experience of mental health problems and services, with Sarah the occupational therapist and PhD student. It may feel risky to need to explain that side to people, and I remain very clear that there is more to me than just that experience, but as it was such a large part of my identity and has shaped who I am today it feels an important thing to do. And if me ‘coming out’ helps challenge some of the stigma that remains then I am more than happy to keep ‘coming out’, over and over. Interestingly I’ve been meaning to write a blog post about stigma since I attended the College of Occupational Therapists’ Annual Conference (#COT2015) in Brighton earlier this month and heard Ruby Wax’s opening plenary, but actually it’s been the debate on Victoria Derbyshire’s BBC2 porgramme on mental health today that has finally got me writing. I debated whether there was any value in me adding to the extensive discussion on stigma and mental health, and to be honest that’s the overhwelming feeling when watching the BBC2 programme: mental health services are inconsistent, underfunded and there seems to be a never-ending discussion about stigma about mental-health problems – possibly without any real change, but still I would like to have my say even if it doesn’t add anything new. So here is my take on mental health stigma and high profile discussions. Conference – Ruby Wax and the Power of Celebrity. Ruby Wax gave the opening plenary at #COT2015. It was billed as “Mental Health, mindfulness and meaningful occupation”, with emphasis on the ‘mental health’ aspect delivered. Ruby discussed her own experience of becoming an ambassador for discussions about good/poor mental health in the United Kingdom and gave her view on the need for increased peer support. While Ruby’s message about challenging the shame caused by mental illness (and possibly that caused by stigma surrounding mental illness) came across clearly, I couldn’t help but feel very uncomfortable with her choice of language to emphasise her points. Ruby is a comedian. Her job is to make people laugh. She uses a type of self-deprecating black humour that I’ve often seen used by people who have experienced mental health problems. This probably works well when she delivers her show in mental health services, as she has been doing, but in this professional setting it felt inappropriate to me. What possibly felt more uncomfortable was that it appeared to be well-received by the audience. In a room full of occupational therapists, the majority appeared to be enjoying hearing a discussion that to me seemed to be advocating a message of the need to challenge stigma and shame, delivered with language that emphasised the stigma and shame (and not only about mental illness – a large number of ‘minorities’ were included in her discussion). Fortunately a quick glance on Twitter during the plenary showed that I wasn’t the only person feeling that way. Since that plenary I’ve been thinking about the power such celebrity mental health advocates have. Ruby Wax is the first to admit she sort of ‘landed’ in the role she finds herself in quite unexpectedly. She is not a mental health professional, however she now is in a role where she is listened to and seen as a voice of authority. I feel quite sad that she gets so much ‘air time’ when I have the pleasure of following so many advocates for mental health services/issues on social media that, I feel, would be much better listened to. Perhaps Ruby’s ‘humour’ makes her more accessible to the general public, but if it is at the cost of her increasing the stigma surrounding mental health problems then I’m not sure if there’s any benefit. A celebrity has a lot of power, and I can’t help but feel that if Ruby Wax reflected on her language of delivery she could have a more powerful voice that did more good, without losing the humour. Shortly after #COT2015, Ruby Wax hit the headlines for her comments about not telling your employer about mental health problems. While I think her concerns are valid, particularly her understanding that in the midst of having a mental illness you might struggle to be the one to challenge workplace stigma, it feels like an uncomfortable message from someone trying to help break down some of the barriers. Is she right? I’m not sure. My own personal experience has been that disclosure has been a very helpful thing. Throughout college/university I found that disclosing my own mental health problems got me the help and needed and it was received without judgment. I’ve also found that at times some of the people I disclosed to did not have the skills to deal with it, but they didn’t discriminate, they just didn’t really know what to do. When things were at their worst I was working for a high street shop about 10 years ago. On reflection I wouldn’t have expected them to deal very well with mental ill health, but my manager was great – quietly supportive and understanding. I have never felt pushed out of a job/course due to my problems. Maybe I’ve just been lucky. On realising the topic of today’s show being a debate about mental health in the UK (available here for the next month), I postponed my day’s trip to the library to do my uni work, and I’m very pleased I stayed. If I’m honest I was intrigued to hear more from Ruby Wax as she was one of the panel. Ruby was challenged about her recent comments about disclosure at work, and while I can understand her message it came across as one that was a bit dated and based on her own experiences. Several members of the audience had experiences that completely supported her view, and perhaps I’m being a bit naive, but I still don’t feel comfortable just accepting that non-disclosure is safer or the right thing to do. Perhaps I have an unfair expectation of people in these ‘celebrity advocate’ roles. I think I want them to be the risk-takers who forge a way through and stand up for ‘the others’. Perhaps, as someone who doesn’t yet blog under her real name, I don’t have the right to expect others to do all the risk-taking. Key thoughts from other areas of the programme. Well, it wasn’t much of a debate! It included honest, powerful messages from people expressing their experience of mental ill-health and services either from a personal and professional position (including carers). It was obvious that many people had been failed by services and that government ‘targets’ are a thing of fiction. The non-debate was evident as almost everyone was in agreement that parity of esteem in mental and physical health is a long way from reality. It was powerful television, and supported my view that there are many advocates out there that a better-informed, more sensitive and more eloquent than some of the celebrities that stand up and speak out. Perhaps we need those celebrities to ‘hit’ the mainstream, but going back to #COT2015 I would much rather have heard from some of the audience members for the opening plenary that squirm in my seat listening to Ruby Wax. One of my main criticisms of the show was Victoria Derbyshire’s incessant questioning of people who spoke about treatment for eating disorders of “what weight were you at your worst?” This felt so irresponsible and showed a lack of understanding of the condition from the production team. 1. Weight is not the best indicator of the severity of a problem. My own eating disorder was at its worst and most dangerous when my weight higher. People die from eating disorders at all different BMIs. 2. On a programme that was repeatedly expressing horror at people needing to be ‘more ill’ before they got help, it was reinforcing that attitude by placing importance on a number. 4. I felt a strange sense of irony that a programme that was also emphasising the need for mental health symptoms to be better understood and validated, appeared to be clinging to one of the physical indicators of a mental health problem to provide some type of justification. This was a very sad message coming across in the programme. There was widespread agreement that early intervention was so necessary and yet many stories were shared about people needing to develop symptoms such as self-harm before they would be ‘worthy’ of treatment. It’s not a new revelation and I wonder when we’ll get to a point where people receive the help they need, as soon as they need it. I’m probably always going to be a little biased, but I was very pleased to hear several people discussing their stories who had received a diagnosis of borderline personality disorder. It felt refreshing to hear it in mainstream media, alongside people with experience of depression, anxiety, biploar and psychosis. Not every mental illness was represented, but it seemed like a more balanced view than some other programmes. It was also interesting to hear common challenges of the diagnosis discussed, such as waiting many years to get the diagnosis and its effect of accessing services, or the challenge of the diagnosis being ‘hidden’ from the person. I suppose the only other area I would have like to have seen discussed was the mental health needs of older people. Most of the participants were young, with only a couple over 50 and those beyond working age were notably absent. While it feels like the parity of esteem for mental and physical health is still far from achieved, although progressing, the consideration of an older person’s mental health needs may continue to be unseen for much longer. So there we go, a slightly rambling blog post, but I wanted to have my say…. Pd2ot Becomes an Occupational Therapist. I miss blogging. I could make excuses about my lack of posts being due to being busy at work, but that wouldn’t fully explain it. When I first started writing I had so many ideas to explore and I made time for the blog. Now it’s dropped into that rather full category of “things I’ll do when I have some free time/am not so tired/am bored”, which has a very low probability of being the chosen occupation if/when any of those situations arose. Why am I not blogging any more? I suspect it’s a combination of feeling a little like I’ve moved on a lot from ‘needing’ to explore pd2ot-type topics and a less conscious disconnection from pd2ot. However, in recent weeks I’ve had a little more time for all things pd2ot, which has reminded me how much I enjoyed writing. So, this is going to be a pretty basic ‘catch up post’ to get me writing. This week actually marks the beginning of my PhD. I’ve spent the last six months working full-time in my clinical role to have time to embed my skills as a newly-qualified occupational therapist and develop a better understanding of the client-group and service my research will be focused on. It’s been great. Tough, challenging, I’ve learned a lot, AND I’m really ready to start work on the research. I’ve always struggled a lot with routine and getting bored, and although my clinical work is so varied and without time to breathe,never mind get bored, I do find that I’m grateful for a new dimension to my weekly routine. I’m really excited to have 3 days every week to just focus on research. It’s probably good timing that I’ve just returned from the College of Occupational Therapists – Specialist Section: Mental Health’s (COTSSMH) Conference at the University of Liverpool. I’m feeling motivated and ready to start my study. As I first discovered at Emerging2OT, live-tweeting added a valuable dimension to my participation in the event. I always enjoy reading other delegate’s perspectives and thoughts on the session they are attending. The only downside is when you’re following the hashtag you may read tweets from a different session that sounds unmissable. At least with tweeting you still get the opportunity to read the tweets even if it can feel like you missed out! Public-speaking and presenting is not something I get too worried about normally, however I suspect the content of this presentation meant I was more concerned about its reception than a piece of assigned academic work. It was my original thoughts and ideas, rather than an answer to a question set by others. I’d debated whether to include my Twitter name on my title slide and to explain where the concept originated from during my preparation. In the end I didn’t include it, but actually felt quite sad that I didn’t ‘join things up’ so fully in the end. The paper was received well and the live-tweeting that accompanied it allowed for pd2ot to be joined up with Sarah, the presenter, which felt really positive and congruent. 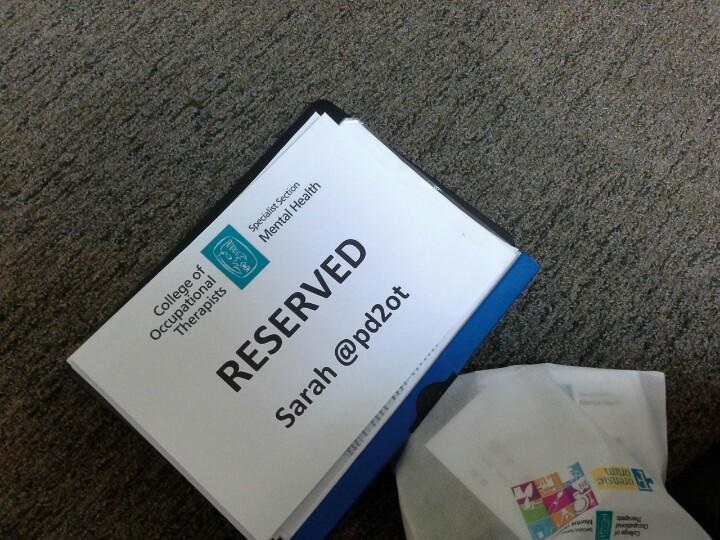 My experience at the COTTSMH Conference prompted me to reflect on how I feel about the ‘pd2ot’ side of me. At times I almost forget that that side ever existed. I think in my current line of work it’s quite easy to forget. So how have the first six months of being qualified occupational therapist been given my history of mental health problems? To answer that I’ll explain a bit more about what’s been happening in that time. I work in a service that is in the early stages of becoming an integrated care team, but at present the physical health side of the job dominates. I work with a great team of people, including a large team of district/community nurses. However there’s minimal formal mental health experience within the team. I think this leaves me wondering ‘how much do my colleagues understand about mental health’. Unlike when I was a student I haven’t needed to disclose much about my mental health history as I am well and don’t need significant adjustment to my work pattern. I do, however, where a uniform that exposes my arms which are very scarred from previous self-harm. As I student I was absolutely terrified of this, and generally agreed with educators that I would wear long sleeves other than when it was necessary for infection control reasons. So in general I’d have a cardigan on when I was in the office. In fact, my university supported me to have a first placement that didn’t require me to be bare below the elbows at all, and allowed me to gradually develop the confidence to expose my arms. On my first day in this job I decided I’d just make sure I was in my short sleeves even when in the office so that I stopped needing to be self-conscious about it (fortunately my office is very warm, so that became a promise I was very relieved to keep!). In terms of reactions from colleagues it has been minimal. One person said “that looks sore” and another asked “Sarah, what happened to your arms?”. Out of the two approaches I prefer the latter. It allowed for a brief, yet honest, discussion about it. Most people, however, have not commented. Partly it feels like it’s a difficult thing for people to talk about and I’m left wondering if people actually know the cause of the scarring – I find it difficult to appreciate how much awareness of self-harm people have if they don’t work in mental health or have personal experience of self-harm. Mostly, though, it feels that my colleagues simply accept me as I am. I’ve always wondered how I’d feel if a patient commented on them. I suspect it will happen at some time but my experience to date would suggest that most people I visit have far bigger things to worry about or even notice, than some old scars on my arms. As many people with be very conscious of, mental health problems are often invisible. Given that my mental health is pretty good at the minute, the only indicator of previous problem is the scarring. I think this probably explains why the ‘pd2ot-side’ can feel very distant at times. As ever, I feel grateful for my experience as a service-user. There are numerous skills/experiences I wouldn’t have without it. I’m also really glad that it is not a defining feature of my experience as a clinician. I feel like I’m a BETTER occupational therapist due to my experience as a service user, but that it is not the only thing I offer the profession. Tonight’s #OTalk in on eating disorders and occupational therapy. Here’s the official blog post – we’d love it if you could join us. Last year, we (@pd2ot and @geekyOT) hosted an #OTalk tweetchat about occupational therapy and eating disorders for Eating Disorders Awareness Week (#EDAW14). We had 63 participants, and tweets from the chat made 659,387 impressions. This year, Eating Disorders Awareness Week (#EDAW15) will run from Monday 23rd February – Sunday 1st March 2015. To coincide with this, we will be hosting another #OTalk on Tuesday 24th February at 8pm GMT (click the link to check your local time). A real strength of the chat last year was having the contributions of clinicians/students and those who had personal experience of eating disorders throughout the chat – this year we’d encourage the same thing. So whatever your background, if you have any thoughts on the below topics, please join us! What types of individual/group interventions could occupational therapists use when working with people with eating disorders? What theory/evidence can be useful?